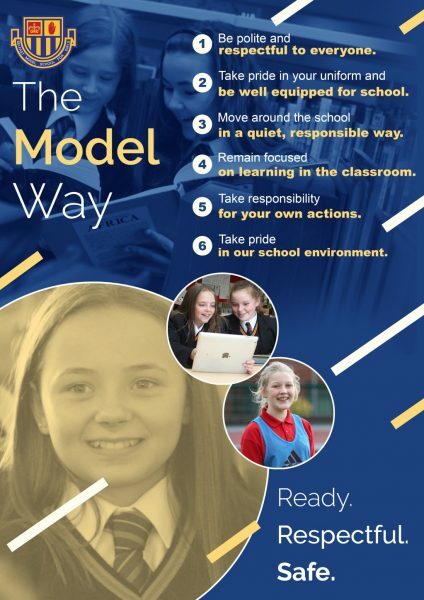 Excellent behaviour is expected here at the Girls’ Model. We endeavour to recognise and reward good manners, politeness and kindness, as well as effort and commitment to all aspects of school life. We congratulate these efforts and achievements by way of Assembly Shout Outs, post cards to parents, certificates, prizes and organised reward events. When sanctions are imposed they will reflect the seriousness of an individual’s offence. They are applied as soon as possible after a school rule is broken and are applied in a fair and consistent manner. It is always our intention that a student is supported and reasons for negative behaviour sought so appropriate help can be given. These are given for low-level misbehaviour or ‘one-off’ offences. Merit points may be deducted from pupils who breaking school rules. These are issued for unacceptable behaviour, unsatisfactory attendance or punctuality. Each pupil on Report Card is reviewed regularly. After school detention can be issued by Heads of year and Heads of Departments. Parents will receive 24 hours notice if pupils are to be detained after school. Wellbeing Support is designed to promote and sustain good behaviour in order to allow pupils to learn. It is used sparingly and is tightly organised and recorded in order to be of maximum effectiveness. e.g. cigarettes, lighters and matches, sharp implements (knives etc). These are confiscated and not returned until a parent/guardian comes to school to retrieve these items. Drugs are dealt with in accordance with school policy. Suspension is used for more serious breaches of the behaviour for learning policy only, such as fighting, bullying, use of abusive language to staff, deliberate damage to school property and so on. Suspension normally takes effect immediately. Parents/guardians will be notified by telephone or in writing. In addition, details of the suspension will be sent to the Education Authority. In very serious cases of breaches of school discipline a pupil may be required to attend the Board of Governors, Disciplinary Panel, accompanied by parents or guardians. Education Authority guidelines are followed to exclude any pupil from school.